Lepra have announced that the 2019 ride has been cancelled. No reasons have been given for this decision. The ride is due to return in 2020, and full details of that event will appear here when they become available. 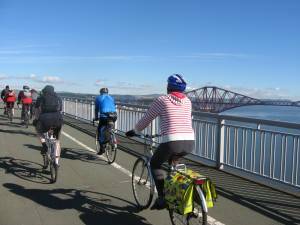 For hundreds of cyclists in south east Scotland, the annual bike ride from Edinburgh to St. Andrews is a high point of the summer. It's a fairly demanding event, but it's one that many ordinary riders - not just the super-fit - manage to finish each year. In doing so, they enjoy a great day out. And they raise a tidy sum for charity in the process. In this article, I'll give you an overview of this popular ride, and try to answer your questions about it. Note that this information is in no way official. I have no connection with the organisers, and this page has not been approved by them. It is based entirely on my own experiences as a regular participant in the ride over the last 20 years. The St. Andrews ride is not a competitive event. You pedal at your own pace, either on your own or in the company of others. There's no pressure to finish at any particular time. The ride takes place each year on a Saturday around the middle of June. The date of the 2019 ride has been fixed for Saturday 15th June. Riders leave Edinburgh at 8.45 am. The fastest usually reach St. Andrews in the early afternoon (and a few even turn round and cycle back again, but they're very much a minority). Most of us arrive mid to late afternoon, although those who prefer a particularly leisurely pace don't reach the finish until well into the evening. The ride can best be described as challenging. After all, it's 68 miles (109 km) of fairly hilly terrain, with at least three tough climbs along the way. But don't let that put you off. If you're a serious cyclist - the sort that goes out on long runs in all weathers throughout the year - the St. Andrews ride will present no difficulties. On the other hand, if you haven't been on a bike for many years, you'll find it very tough going. In fact, you'd be advised to look for some gentler ways of getting back in the saddle. Most folk who do the ride fall between those extremes: ordinary cyclists who use their bikes for commuting or getting around town, or perhaps for an occasional short ride in the country, but who don't consider themselves to be especially fit. If you're in that group, you should find the St. Andrews ride do-able, but you will need to get in a few serious training runs in the weeks leading up to the event. First and foremost, the ride is a charity event. Its aim is to raise money for Lepra, a UK-based charity best known for its work in preventing and treating leprosy. Leprosy is a disease that affects the most vulnerable people in the world, causing life-changing disabilities. As well as treating people affected by the disease, Lepra promotes health education and raises awareness to reduce its stigma. Cyclists who take part in the ride are expected to raise money through sponsorship. Last year, well over £50,000 was raised in this way. If you don't feel comfortable asking your pals for sponsorship money, consider making a donation in your own name. It's salutary to remember that raising just £21 through donations or sponsorship makes it possible for Lepra to run a school education project reaching a hundred children. You can find more information about Lepra's work on their website. The ride is supported by a repair van (courtesy of the Edinburgh Bicycle Cooperative) and an ambulance. These vehicles patrol the route, ready to help anyone suffering minor injuries or mechanical problems. Note that the breakdown van can only deal with a limited range of problems; it's your responsibility to ensure your bike is in good mechanical order. For those planning to stay in St. Andrews overnight, a luggage van will carry your heavier items, for a nominal charge. What about meals and refreshments en route? The catering arrangements on the ride are second to none. 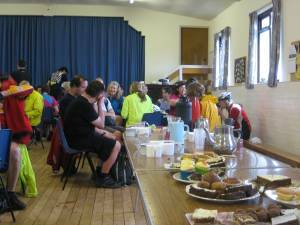 In Kinross, the local Round Table provides an excellent lunch service, in which they sell a range of soups, sandwiches and snacks. In Freuchie, the parish church offers a fabulous selection of home baking, along with hot and cold drinks, at very modest prices. Many riders say that this afternoon tea stop (see photo) is a highlight of the day. Lepra lays on transport to take bikes and riders back to Edinburgh after the event (buses for riders, lorries for bikes). These leave at about 7 pm on the Saturday evening. The cost is £17 for you and your bike. In the past, there has also been a bus service on the Sunday morning for the benefit of those who wanted to stay in St. Andrews overnight, but this is unfortunately no longer available. Another option would be to cycle the five miles from St. Andrews to Leuchars - if you've got the strength - where there are frequent train services to Edinburgh via the Fife coastal towns. But be warned that the cycle accommodation on these trains is limited, and you won't be the only one with the same idea. Northbound trains - to Dundee and beyond - are likely to have more space. The map shown here will give you a rough idea of the route. This is only meant to be an overview; it does not necessarily represent the definitive route, which, in any case, varies slightly from year to year. When you sign up for the ride, you'll be sent directions for the actual route to follow. The ride used to start in Edinburgh city centre. In 2011, because of tram works in Princes Street, it was moved to the west gate of Inverleith Park, and this has now become the permanent start point. 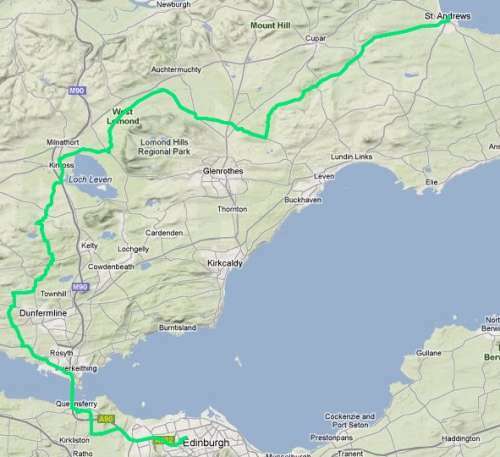 The route leaves the city by way of Queensferry Road, Dalmeny, and the Forth Road Bridge. It skirts the west and north of Dunfermline before heading over Cleish Hill (the highest point on the route) and on to Kinross. There's a relatively level stretch as you approach Falkland, but then come more hills - including the steepest ascent of the day, just after Freuchie. But once you reach Craigrothie, the climbing is over, and you can enjoy a long gentle descent for the last ten miles into St. Andrews. The first couple of dozen miles include several short stretches on main roads, and are not particularly scenic. But the ride rapidly improves once you reach Cleish Hill. After that, the route follows quiet roads through delightful woodlands or on high ground with excellent views. For the most part, this is a very attractive ride. 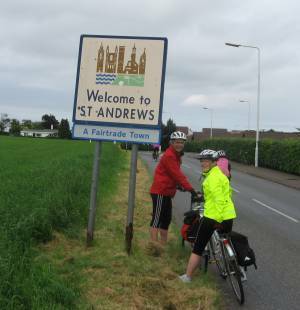 The ride's official end point is in the centre of St. Andrews, at the bandstand in Golf Place. Lepra representatives will be on hand there to validate your sponsorship form, hand out certificates, and congratulate you on your achievement. Fortunately, the St. Andrews ride is not as bureaucratic as certain other charity runs. The organisers do ask you to register in advance, but this is a simple matter. There is a registration fee of £20 (£10 for concessions or children). It is also possible to register on the day, but it is very much easier all round if you can do so in advance. If you wish, you can register on-line with a credit or debit card. Alternatively, just send your name, addresss and phone number (along with those of anyone else you wish to register at the same time) to Olivia Egan, Lepra, 28 Middleborough, Colchester, Essex, CO1 1TG. Be sure to include the registration fee for each person. If you wish to book a place on the bus back to Edinburgh, enclose a further £17 per person. If you have any questions about the Lepra ride, contact Olivia Egan at the above address (or phone 01206 216711, or email ). I hope this article has encouraged you to have a shot at this very worthwhile event. For most of us, the ride is a tough one, but it's for an excellent cause, the atmosphere is tremendous, and you'll get a wonderful sense of achievement when you finish. Give it a go. The official Sustrans map showing bike routes around Edinburgh and Glasgow, including the Union Canal and the Forth and Clyde Canal. Copyright Mike Lewis Consultants Ltd. and contributors, 2012 - 19. You may copy short extracts from this page for non-commercial use, provided you acknowledge the source and include a link back to the original page. All other copying or re-publishing is prohibited.